Family history, age, a history of heavy manual labor, joint laxity, smoking, and increased weight are all identified as contributors to this disease.The symptoms of OA at the DIP joint commonly include pain and changes to the size and shape of the joint. The visible changes may be due to the formation of a Heberden’s node; a calcified spur or osteophyte that forms on the top or the side of the joint. These symptoms often lead to functional concerns including difficulty with household tasks, opening containers, writing, and manipulating small objects. The functional implications suggest the importance of taking care of symptoms of hand OA when they occur to avoid a decline in function and an increase in pain. 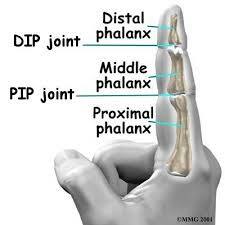 So what is it we should do for the pain and deformity related to arthritis at the DIP joint of a finger? According to research, there is evidence that gentle exercise will assist with decreasing pain and increasing grip strength and that joint protection techniques are effective at decreasing pain. Heat or paraffin may also be used to assist with decreasing pain and improving mobility. Additionally, a splint for the DIP joint is a common recommendation for the treatment of DIP joint arthritis. A cohort study of individuals with DIPJ arthritis had a 66% improvement in pain symptoms with the use of a splint during activity. A more recent study also found that use of a splint at night during sleep, for 3 months, decreased pain and improved the deformity associated with DIP joint arthritis. The Oval-8 Finger Splint offers a convenient method of splinting the DIP joint for arthritis. The Oval-8 can be fit to the joint and are low-profile, causing minimal interference in daily functioning. For more information on treating your patients with the Oval-8 Finger Splint click on the button below. 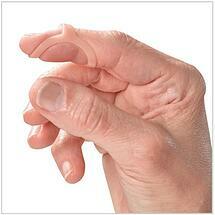 Are you a patient looking for more information on the Oval-8 Finger Splint for Arthritis?